Almost 12 years to the day after the release of Titanic, James Cameron finally returned to the world of feature films with 2009’s Avatar - and he came back with a bang. Like Titanic, Avatar arrived with an enormous budget and many predictions of doom and failure. Like Titanic, Avatar made those prognosticators look stupid. The film became an immediate smash and ended up with a stunning box office total of almost $750 million in the US. This means Cameron directed the biggest movie of the 1990s and the biggest movie of the 2000s. Set in the year 2154, humans invade the planet Pandora to mine a mineral called Unobtanium, and two schools of thought exist related to this endeavor. The military wants to simply bomb the Na’vi natives and take the Unobtanium, whereas scientists prefer a gentler method. As part of that, volunteers learn how to integrate with the Na’vi via “avatars”. These genetically engineered creatures look just like Na’vi but they incorporate characteristics of their human counterparts. To do so, the humans enter a tank that allows them to control their Na’vi avatars from a remote location. This means they can blend with Na’vi society and try to find a peaceful way to gain access to the Unobtanium. Jake Sully (Sam Worthington) ends up as an unlikely participant. His twin brother was the one trained to do the work, but he died. With a massive financial investment in his brother’s avatar, the authorities recruit Jake because his genetic makeup matches the Na’vi counterpart. The problem? The other volunteers went through intensive training to understand Na’vi society, while Jake just has to wing it. Before long, Jake finds himself deeply involved in the Na’vi world, and this makes him the best “human” ambassador, especially when Jake develops a very close connection with Neytiri (Zoë Saldana). We follow Jake’s interactions with her and the others as well as other developments related to the human invasion plan. When I first saw Avatar, I tried to do it right. Its theatrical run offered three flavors: regular 2D, “standard” 3D, and IMAX 3D. The latter seemed like the best way to take in such a big big big film, so that’s where I went. And I left the theater distinctly underwhelmed. I can’t say I disliked Avatar, but I can’t say I particularly enjoyed it, either. Granted, a little motion sickness probably affected my pleasure. The combination of 3D and camera movement made me a bit googly at times. However, this wasn’t a repeat of something like United 93, a film with so much “shakycam” that I barely could peek at its second half. Some motion discomfort occurred during Avatar, but not enough to mar my screening of it. When I left the theater, I figured that my lack of enthusiasm for Avatar may’ve stemmed from my expectations for it. Actually, I didn’t look forward to the movie with great anticipation. To be honest, the previews I saw didn’t make it appear especially interesting. However, I put a lot of faith in Cameron. He’s only made one bad film in his career, and that one - Piranha 2 - barely counts since it was his “foot in the door” effort. From Terminator to Titanic, every other Cameron work ranged from pretty good to great. So even though Avatar itself didn’t create much excitement in me, the Cameron name ensured that I’d expect Great Things from it. When those feelings didn’t emerge, I was disappointed but not surprised, and I knew that my opinion was a work in progress. 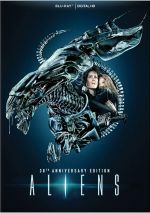 Heck, I didn’t think much of Aliens when I first saw it, and that’s been my favorite movie for decades. Did my subsequent screenings of Avatar elicit a different reaction from me? No, not really. On the positive side, I thought the movie maintained my attention well during the repeat viewings. Whatever negatives I’ll throw at Avatar - and I will do that – I can’t criticize its pacing and flow. Though it runs a potentially draggy 162 minutes, the flick goes by quickly and never feels long. It keeps us with it and involved in the story. Well, kind of. Perhaps my biggest problem with Avatar stems from my near-total inability to connect with its hero characters. By “hero characters”, I mean the Na’vi, as they’re intended to be the positive role models. Yeah, Jake is the film’s protagonist, but he’s human only in theory. The film depicts his metaphorical – and eventually literal – transition from human to Na’vi form, so we really don’t think of him as a man. And that’s a concern, as I just can’t buy into the Na’vi, partially – and maybe mainly – because they’re just animated characters. I can easily invest in cartoons when they show up in totally animated films ala Up or whatever other flick you like. I can also get involved in artificial characters in live-action movies such as ET the Extra-Terrestrial. Damn, I still cry every time that stupid puppet dies! So why don’t I give a hoot about the Na’vi? Some of it comes from the stale story and thin characters – more about those later – but a lot of it stems from the movie’s combination of live-action and CG animation. Again, in an all-animated world, I accept the “reality” of the characters, and in a real environment populated by existing creations like ET or Yoda, I can believe those participants. Sure, I know ET and Yoda are puppets, but at least they’re objects in a real world that interact with actual people. Unlike the bits and bytes that are the Na’vi, and that’s a problem – for me, at least. Plenty of others clearly encountered no trouble when they needed to suspend disbelief and invest emotionally in the Na’vi, but I couldn’t do it. Whenever they interacted with humans, I just felt reminded of their unreality. In technical terms, the Na’vi and avatars looked good and occasionally were quite believable – but not always, and not consistently enough to allow me to suspend disbelief. CG characters just aren’t “there” yet. They’ve made big strides, and Avatar definitely gives them another push closer to approximating reality, so there are times the Na’vi do feel real. But those occasions don’t occur frequently enough to get me to accept them. Their faces look too plastic and their movements are too abrupt – they come close to reality, but they just don’t get there. Again, in an animated movie that doesn’t attempt to be “photo-real”, I’m fine with that. However, when a flick wants us to accept cartoons among live-action characters, it’s a problem. Whether due to that absence of believability or other narrative issues, I never gave a hoot and a half about what happened to the Na’vi. Try as I might, I just couldn’t care about the fates of these big, blue cat people. They’re noble, they’re brave – and they’re utterly boring cartoon critters. Which comes back to the film’s problems with narrative and characters. Cameron’s script has received tons of criticism, and the weak story is the likely reason Avatar didn’t win Best Picture over the mediocre Hurt Locker. Essentially, Avatar offers a combination of Disney’s Pocahontas and Dances with Wolves. You get your standard Awful White Men along with your usual Noble Indigenous People in Touch with Nature and the protagonist who goes native. We’ve seen it all before, and we’ve seen it in a manner at least as dramatic and emotional. Had Cameron delivered this stale narrative without the standard helping of one-dimensional characterizations/themes, I would’ve been much happier with Avatar. Unfortunately, like Wolves and Pocahontas, Avatar mostly serves as a commentary on how terrible and evil white men are – and how perfect and wonderful the indigenous folks are. No, I’m not defending the aggressive antagonists in Avatar or those other movies, but I will say I’m really sick of this kind of worldview. It paints such a one-sided, flat picture that it gets old very quickly. None of these criticisms should be viewed as an indication that Avatar is a bad film, for it’s not. As I mentioned, it’s consistently entertaining, and it does provide astonishing production values. Avatar gives CGI a total bump to the next level. Unfortunately, the movie simply lacks much heart. Perhaps it seems illogical that I loved Titanic and was left cold by Avatar since the characters in the former weren’t much more three-dimensional than these and the story was equally trite. Heck, we even knew how the movie would end! For whatever reason, though, I totally invested in the characters/emotions of Titanic and never dug into those sides of Avatar. Maybe it’s because the former boasted the advantage of its historical impact, or maybe it’s just because I can better related to humans than I can big blue cat people. All I know is that Avatar takes us on a pretty ride that has some good adventure along the way, but it lacks the emotional punch to make it truly satisfying. Avatar appears in an aspect ratio of approximately 1.78:1 on this Blu-ray Disc. I thought this was a stunning presentation. Much of the movie featured computer animation, so the experience often was no different than watching something from Pixar. This meant that the full CG scenes were just as impressive as the best animated transfers. Sharpness was immaculate. Fine detail could be astonishing, as even the widest shots maintained excellent definition. The live-action scenes weren’t quite as awesome, but they still looked great. Actually, I suspect that a full live-action movie with the same quality would’ve floored me, but because the CG shots were so amazing, the live-action bits could come across as a little soft. They weren’t, but they just weren’t as stunning. Still, all parts of the movie – live-action or CG – presented terrific delineation. No issues with jagged edges or moiré effects appeared, and edge enhancement was absent. I also failed to discern any source defects in this totally clean transfer. In terms of palette, the movie favored a blue-green tint that worked for the nature theme. Other hues cropped up as well, though, and these appeared quite full and lively. Blacks appeared deep and dense, while shadows showed nice delineation. Across the board, this was an absolutely amazing visual presentation. One note about the aspect ratio: Avatar doesn’t offer the film’s theatrical dimensions. It ran at 2.35:1 on the big screen, while the disc opens that up to 1.78:1. According to Cameron, the movie was composed at that ratio and cropped to 2.35:1 theatrically, so this version theoretically better represents the director’s vision. I’m not particularly sure why Cameron didn’t use 1.78:1 theatrically if that’s what he wanted in the first place, but hey, he’s the king of the world and I’m just some shmoe with a website. Whatever the case may be, I wanted to mention the aspect ratio and let you know of the change. The DTS-HD MA 5.1 soundtrack of Avatar impressed, as this was an immersive mix that used all the channels to good effect, especially in the film’s second half. The first 80 minutes or so tended toward more character/story information, so those segments lacked a ton of big set pieces. Nonetheless, some good action moments occurred – especially when Jake and the others encountered various Pandora wildlife – and the film maintained a fine sense of environment. The mix engulfed us in the alien setting in a natural, smooth way. If you want to show off your HT, though, you’ll have to head to the second half of the movie, for that’s where most of the action resides. The entire final reel offered essentially a demo reel, as it boasted almost non-stop mayhem. With gunfire, flying vehicles/creatures, explosions and attacks, these segments kicked the track into high gear and created a vivid, impressive soundscape. Audio quality always excelled. Speech was natural and concise, with no edginess or other concerns. Though the score occasionally threatened to get buried beneath the din, the music nonetheless remained clear and full. Effects offered the best aspects of the track, as they were consistently expansive and dynamic. Across the board, this was a terrific mix. This packages includes both 2D and 3D versions of Avatar. The picture comments above reflect the 2D rendition – how did its 3D counterpart compare? Visuals seemed virtually identical. If any degradation came along with the 3D rendition, I didn’t see it, as I thought it matched up with the 2D edition well. When it hit screens in 2009, Avatar took 3D imaging to its highest level, and the meant a Blu-ray that provided outstanding stereo material. All aspects of the presentation excelled, as the movie boasted terrific depth and a slew of stunning sequences that offered amazing movement and impact. Most of these came from the many flying/floating elements, but those weren’t alone. It became tough to pick a standout moment because so much of the film looked great. Avatar remains one of the most impressive 3D movies ever created. 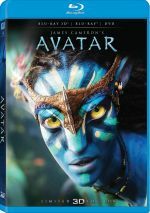 A separate extras-packed Collector’s Edition of Avatar appears on the market, but this set provides no bonus features. It gives us a DVD copy of the film but nothing about the movie’s creation. After 12 years away from feature films, James Cameron returned with a bang. Avatar dominated the box office for weeks and became the biggest hit since… Titanic, Cameron’s prior flick. I wish I could say that Avatar was as satisfying as Cameron’s prior blockbuster, but it’s just not in the same emotional league. Both have similar plusses and minuses, but Avatar simply lacks the same heart and power. It’s an enjoyable flick with excellent visuals but not one that packs a punch. As for this Blu-ray, it represents the movie in a satisfying fashion. Picture and audio are always absolutely terrific, but the package comes devoid of supplements. It’s a shame that this set lacks bonus materials, but the 3D version stands as the definitive way to watch Avatar.